The Simon Wiesenthal Center today protested the failure of the Romanian judicial authorities to complete their investigation of four suspected Romanian Nazi war criminals whose names were discovered in the framework of the Center's “Operation: Last Chance” project, which offers financial rewards for information which facilitates the prosecution and punishment of Holocaust perpetrators. The project, which was officially launched by the Center's chief Nazi-hunter Dr. Efraim Zuroff in Bucharest in September 2003, has hereto yielded the names of eighteen suspects, four of which were submitted sixteen months ago to Romanian Prosecutor-General Dr. Ilie Botos. The four individuals in question are suspected of participation in the murder of Jews in Bucharest , Iasi , Dorohoi, Odessa and other places during World War II. The Simon Wiesenthal Center 's Annual Status Report on the worldwide investigation and prosecution of Nazi war criminals has singled out Romania for special criticism for its failure to take practical measures to investigate Nazi war criminals and its refusal to cancel the pardons issued to convicted Romanian Holocaust perpetrators Gheorghe Petrescu and Radu Dinelescu. In a statement issued today in Jerusalem by the Center's chief Nazi-hunter Dr. Efraim Zuroff, who is the author of the report, the Center clarified that it was extremely distressed by the total lack of initiative exhibited by the Romanian judicial authorities in bringing local Nazi war criminals to justice and was particularly disappointed by the refusal of the same authorities to accede to the Wiesenthal Center's appeal-submitted in early January 2004 to Attorney-General Dr.Ilie Botos-to cancel the pardons granted several years previously to convicted Nazi war criminals Colonel Gheorghe Petrescu and Colonel Radu Dinulescu. For additional information please call:972-2-563-1273 or 972-51-214-156. 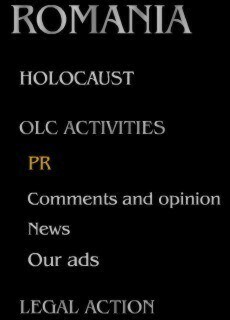 The Simon Wiesenthal Center announced today that it was inaugurating a special hotline in Romania for information regarding the current whereabouts of Nazi war criminals in the framework of its “Operation: Last Chance” project which offers financial rewards of $ 10,000 for data which will facilitate the prosecution and conviction of Holocaust perpetrators. It will be in operation from 9 AM to 5 PM during the workweek. Dr. Efraim Zuroff will be arriving in Bucharest next week to open an exhibition on the Holocaust prepared by the Simon Wiesenthal Center which will be opened on Friday, January 23 at 12 noon in the presence of President Ion Iliescu at the National History Museum in Bucharest. The Simon Wiesenthal Center's chief Nazi-hunter Dr. Efraim Zuroff will visit Romania this week to launch the Center's “Operation: Last Chance” project which offers financial rewards for information which will lead to the conviction and punishment of Nazi war criminals. “Operation: Last Chance” was initiated last year in the Baltics and has already led to the opening of three murder investigations in Lithuania. Dr. Zuroff will be conducting a press conference on Friday, September 12 at a time and place to be announced. He can be reached starting Thursday afternoon, September 11 at the Lido Hotel in Bucharest. Tel: 314-4930 or at 972-51-214-156.